Around 10AM, 1/1/2010, Nelson, New Zealand, 41°18 0"S / 173°13'10"E.
Rose Pelvin, Blenheim, New Zealand; 10 minutes before the end of New Years Day! To friendship, favorite tools, and things made by our own hands! is this a new year's tradition to post pics of your looms? I didn't know. 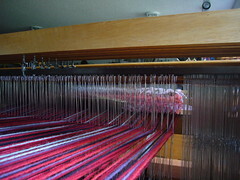 I've put some loom pics on my blog. Thanks, Judy! Lovely! I like the careful way you "saved" the end of the last scarf on your 24-shafts! Fun idea....I just groggily posted loom pics! Hi - Great idea! Here is my link too. Just posted a pic of loom, late I know! Thank you so much, everybody, on such a short notice. I love nosying around other people's looms, and this has been just great! What a fun idea! I took the time to photograph mine as well. Hey, hey, hey, Geodyne! Have a lovely 2009! You inspired me to take some pictures and write a blog post (a fairly rare event lately), so thanks Meg! Shall we try to make it a more frequent thing, Sue? Well done, Holly. Happy New Year to you, too. If you can give me a link to a bigger picture, let me know, because I'm dying to have a closer look at the warp! Meg, following some wonderful blogs and a bit late due to blogger, but here is my stat of 2010 loom stable. Hi, Theresa. Happy New Year anyway. Ummm... Can you please tie the bigger puppy while I look around your house??? Thank you, Polly! HNY to you!